A small pilot study of older people suggests that taking a daily supplement of a nutrient that is present naturally in foods may improve artery health and blood pressure. A certain type of supplement may promote healthy arterial aging and reduced blood pressure. The researchers, at the University of Colorado Boulder, found that the supplement — called nicotinamide riboside — mimics some of the effects of caloric restriction and activates several identical biological pathways. Studies of caloric restriction — which have been done mainly in rodents and fruit flies and not so much in humans — indicate that reducing daily calorie intake by a third may delay the aging process and lengthen lifespan. The new study found that taking nicotinamide riboside supplements significantly improved blood pressure in people with mild hypertension, or elevated blood pressure. Should the results be confirmed in a larger clinical trial, the researchers think that they could have important implications in biomedicine, such as increasing treatment options for elevated blood pressure. Elevated blood pressure and stage 1 high blood pressure are now defined as a blood pressure of 120/80 or 139/89 millimeters of mercury, respectively, which — although is not high enough to justify medication — is high enough to raise the risk for a heart attack or stroke. Currently, the recommended options for people with elevated blood pressure include changes to diet and increasing physical activity. Senior study author Doug Seals, who is a professor and researcher in the Department of Integrative Physiology, and his colleagues report their findings in a paper due to be published in the journal Nature Communications. In a Western culture, stiffer arteries and the high blood pressure that results from them as we age is so common that it is accepted as a normal consequence of aging. In the United States, an estimated 103 million adults have high blood pressure, and this figure is expected to rise as the population continues to age. However, there is evidence that stiff arteries and high blood pressure are not necessarily a normal consequence of aging. Although genetics plays a role, preserving artery health as we reach our 70s and beyond also depends on things that we can do something about — such as lifestyle and diet. Nicotinamide riboside is a trace nutrient present in certain foods such as cow’s milk and in higher concentrations in dietary supplement form. Studies have indicated that the nutrient contains “unique properties as a vitamin B-3” that include: raising insulin sensitivity; boosting the effects of exercise; protecting the brain; and resisting the harmful effects of a high-fat diet. 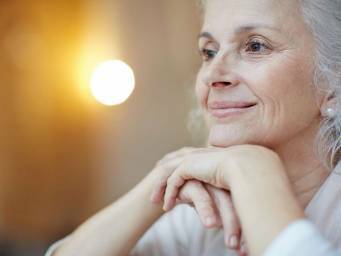 Learn how having a total cholesterol level higher in later life than it was in midlife is linked to a lower risk of marked cognitive decline. For their study, Prof. Seals and his colleagues recruited 24 lean and healthy men and women from the Boulder area. Their ages ranged from 55 to 79 and they were put into two groups. One of the groups took 500 milligrams of nicotinamide riboside chloride twice per day for 6 weeks, then spent another 6 weeks taking a placebo. The other group followed the opposite pattern: they took a placebo for 6 weeks, and then a twice-daily 500-milligram dose of nicotinamide riboside chloride for another 6 weeks. The team analyzed blood samples that the subjects gave at the end of each treatment period, and they took other “physiological measurements” at these times. There were no serious side effects. The results showed that taking 1,000 milligrams of nicotinamide riboside each day increased levels of nicotinamide adenine dinucleotide (NAD+) by 60 percent. NAD+ is a compound that activates sirtuins, a group of enzymes thought to be responsible for the beneficial effects that calorie restriction has on healthy aging and longevity. The compound — levels of which tend to wane with age — is involved in many of the body’s metabolic processes. There is a theory, which is supported by research, that our bodies are programmed by evolution to conserve NAD+ when food is scarce, and that this is activated when we restrict calorie intake. More recent research has also begun to investigate the possibility that older adults might regain this protective property and age more healthily by taking supplements of “NAD+ precursors,” such as nicotinamide riboside. The results also found that nicotinamide riboside supplementation caused a drop in systolic blood pressure of 10 points in 13 of the participants who had elevated blood pressure or stage 1 high blood pressure. This represents a 25 percent reduction in the risk of having a heart attack. The researchers conclude that their paper is a step forward in highlighting the potential benefits of nicotinamide riboside supplementation in older adults. However, they point out that there is still a lot of work to do to confirm that it is safe and effective. They hope to investigate the specific impact of nicotinamide riboside on artery health and blood pressure more robustly in a larger clinical trial. In the meantime, another trial is about to investigate the effect of the supplement in older people with mild cognitive impairment, a condition that often precedes Alzheimer’s disease.